Back on the road, with its improvements and Red Line Shockproof LT gear oil, we are continually amazed at how nice this car drives. While our full attention is on our Tiger project, we wanted to get our 1963 Chevrolet Corvair Monza Spyder ready for a local Corvair meet August 19 in the Ormond Beach, Florida area. To that end, we had to attend to a few things. First and foremost, the shift shaft seal was leaking prodigious amounts of transmission oil onto the ground. Once the area was cleaned up, the repair was as simple as pulling the old seal out with a sharp object, putting an appropriately sized socket over the new seal and gently tapping the new seal into place. 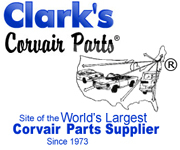 A new rubber boot was also obtained from Clark’s Corvair parts. They seem to be the leader in Corvair parts. Their prices are reasonable, their service is quick and friendly, and their staff is very knowledgeable. We will be going back to Clark’s to help with our future needs. While we were under the car, we painted and reconnected the front anti-roll bar (with new bushings) that came in the trunk of the car. We also fixed a minor fuel tank leak with some epoxy. We will be replacing the tank when we can find one, but we want to keep this car on the road in the meantime. Back on the road, with its improvements and Red Line Shockproof LT gear oil, we are continually amazed at how nice this car drives. New 14 inch Firestone tires and a set of Konis combined with the front anti-roll bar make this car handle and ride very well, especially considering its age and reputation. As we make small improvements to this car, it is quickly becoming our favorite. When the mechanical work was done, we went over the newly buffed car with Meguiar’s cleaner/wax and were impressed with how much of the shine came back. Next up will be a thorough brush touch up and we will be looking for some new chrome and a carpet kit. A more complete front-end rebuild is also in order. We will explore disc brake conversion options, too.